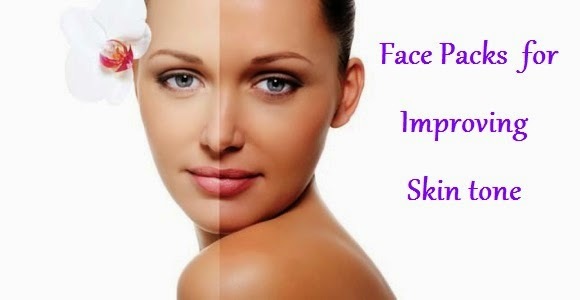 Again its Monday and I am back to share 5 Face packs for Improving Complexion, which can be prepared easily at home with easily available ingredients.These are 100 % natural and are free from chemicals, thus have no side effects.These may not work as fast as the ready made products which are available in the market,but the results these home made packs bring are permanent,unlike the market ones which bring instant results which vanishes once we discontinue to use them. 1) Almond Face Pack : Soak 5-7 almonds/Badam in milk overnight, grind them into fine paste in the morning,add a tsp of lemon juice to it and apply this paste all over the face,leave it for 30 mins and then wash with luke warm water and then with cold water. 2)Sandal wood Face pack : To 1 tbsp of Sandal wood powder,add 1 tsp of multani mitti/fuller's earth and enough of rose water to make a smooth paste.Apply it to the face and leave on for 25-30 mins.Wash it with cold water with light massaging. 3) Gram flour-Turmeric Face pack : To 1 tbsp of Gram flour/besan, add a pinch of turmeric powder and 1 tbsp of milk and mix it into a paste.Apply this to face and allow it to dry and then rinse with cold water. 4)Potato Face pack : Soak multani mitti in potato juice for 30 mins and then apply it to face,leave it for 20 mins and rinse with cold water. 5)Cucumber Face Pack : Mix cucumber juice with honey and lemon juice,apply it to face and leave it for 15 mins and wash with luke warm water and then with cold water.